Welcome to Pro Arte Piano! I am Peter Zielinski, and I am a piano technician based in Silver Spring and Hagerstown, MD. I work on pianos in concert venues, for institutions and in homes of music teachers and private individuals. I specialize in concert tuning, voicing, regulation and rebuilding of pianos. I work on all instruments but particularly enjoy voicing new and vintage American and European pianos. I have developed an unique skill set due to my musical training at Peabody Conservatory and Paris Conservatory, concert career, teaching piano and classical guitar, engineering training and training seminars with Steinway, Yamaha, Bosendorfer, Kawai, and luminaries of the piano technology world. I am always learning new skills in the piano trade and I network with best individuals and companies in the rebuilding world. I often work in Washington D.C., Montgomery, Frederick and Washington Counties and Shepherdstown WV. Other areas on special request. I would be delighted to work on your piano! Regulation of a recent Mason Hamlin grand piano and ongoing concert tuning for an institution. 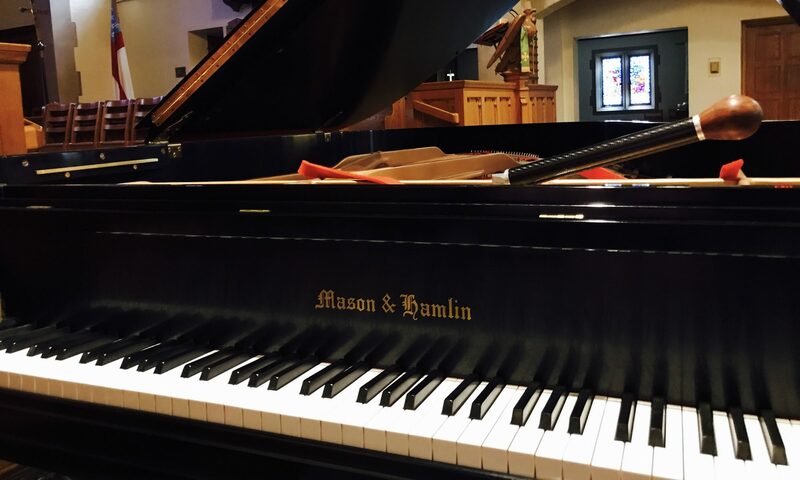 Our Mason & Hamlin piano at Grace Episcopal was sounding poorly after seven years of service playing, rehearsals and concerts. We purchased the piano new in 2011 and it had an unusually beautiful sound, and of course, as a new piano the action was just perfect and a joy to play. Churches like Grace are notorious as spaces that contribute to the deterioration of instruments due to an unrelenting cycle of temperature variation from very hot to very cold as often as every few days, as well as being a place where many people are playing the same instrument. Needless to say, our new grand wasn’t sounding very “new” after seven years and received lots of complaints from performers and teachers alike. We knew we had to spend some money on it for a regulation. Piotr Zielinski came by and listened to the piano at some length and gave us his best estimate of $2,400.00 to do a full regulation. After searching around we realized this was a fair estimate for what needed to be done. Piotr was excited about the project and he spoke a good bit about the technical details about what he wanted to address with the piano action and sound. I certainly couldn’t follow much of the discussion, but it was helpful and reassuring to know that artisanship was alive and well in Piotr. Too often technicians of all stripe lose interest in the minutiae of such tasks, but Piotr holds a fascination with instruments, probably due to the fact that he is also a consummate musician and performer. What we ended up with after the regulation was a piano action that is, in some respects, better than new. As a performing musician, it seems to me that what Piotr does is approach mechanicals from the perspective of what he feels will produce a quality of sound that an instrument should be able to make. At Grace we learned that this approach was clearly the best way to restore parts of our piano. Unevenness of tone was gone, key action faster and sharper even than new, and probably the best result is that I can predict the intensity of attack and the following resonance that I will produce before I touch each key. Predictability is essential for what do as a pianist and a marvelous result of the regulation. Piotr also worked to make the piano more reliable, able to stand up to some very heavy handed players who perform at Grace, by making the restored action more bullet-proof. Even after several months of some real bashing by several modern music performers, the action hasn’t given even a little and still feels as sturdy as when Piotr finished our regulation. And in the end Piotr came in under budget on the project, something our administration certainly appreciated. I cannot recommend Piotr to other musicians highly enough as an artisan piano technician who will listen to your concerns and work to produce the highest quality of workmanship for your instrument. Tuning and repair of a vintage Baldwin grand piano. After moving twice, our Baldwin Grand needed tuning and service. Previous tuners were no longer available, so we were very pleased to discover Piotr Zielinski. His work was excellent, he thoughtfully explained some much-needed maintenance, and the instrument has sounded so much better since his visit last fall! If your piano needs attention from a knowledgeable, high quality piano technician, I recommend Mr. Zielinski. Purchase and reconditioning of a vintage Knabe grand piano. I bought a beautiful vintage Knabe grand piano from Piotr last year and I could not be happier with the purchase and his service. Not only did he find the piano for us, he french polished the whole piano case, replaced keytops, adjusted the action and tuned it. I recently had Piotr install a Dampp Chaser to protect the soundboard and countless wooden parts from fluctuating humidity levels. A wise investment. Piotr is professional, friendly, and his workmanship is exquisite. The sound and touch of our piano is perfection! I highly recommend him! Tuning and repair of a vintage Knabe grand piano. A few months back I was in dire need of an accomplished tuner for my Knabe Grand Piano and a friend recommended the Pro Arte Piano Service. Living a bit off the beaten path, I found it difficult to find a professional to repair and tune my piano. Piotr came, examined my piano, tuned it to perfection and fixed my ailing pedal lyre that had been broken. He was meticulous and when he finished, it sounded like a brand new instrument! Not only is he a technician but an accomplished musician. I recommended him to all my colleagues at Shenandoah Conservatory. Concert tuning and ongoing maintenance of three recent Yamaha grand pianos for an institution. work. Also, when you call him to schedule a tuning, or other work, he is usually available within a reasonable amount of time. He also installed Dampp Chaser units on all three pianos, and made sure that I knew what I needed to do to keep these units working properly. the life of our pianos. I developed my passion for piano technology initially working on my own instruments. After acquiring a vintage concert grand Kawai piano that needed frequent tuning and repairs I learned how to tune and maintain pianos. My piano students noticed dramatic changes in my piano tone and performance and I started receiving requests and referrals for piano work. As i continued getting referrals, I decided to join the Piano Technicians Guild to further improve my skills, when I had the opportunity to participate in many great training programs. Especially important were factory seminars with Steinway, Yamaha, Boesendorfer, Kawai and others as well as presentations by well known concert technicians and rebuilders. I currently operate a rebuilding atelier in Hagerstown, MD and travel to tune in the tristate area and the DMV. Please contact me thru the form below or call 202 236-4523. Thank you for visiting Pro Arte Piano website. Hope to see you soon!